At Island Home and Garden, we are able to match this with first of all, our locally grown Tuberose which is in season from May through October. The tall slender stalks are capped with white flowers which open over a week, and reveal their own distinctive perfume. 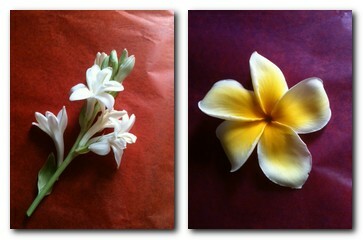 We can use a few blooms in a lei, and a few stalks are enough to infuse a whole house! This year we have been lucky enough to ship in yellow Plumeria blooms, and we are threading them amongst orchids to give our custom leis a burst of color and aroma. The blooms are a wonderful addition to our already extensive array of colored orchids, and the scent will carry you back to your last island vacation!